Doug Engelbart invented the computer mouse in the early 1960s in his research lab at Stanford Research Institute (now SRI International). The first prototype was built in 1964, the patent application for this “X-Y position indicator for a display system” was filed in 1967, and US Patent 3,541,541 was awarded in 1970. Although many impressive innovations for interacting with computers have followed in the last 50 years since its invention, the mouse remains to this day the most efficient hands on pointing device available. The basic idea for the mouse first came to him in the early 1960s while sitting in a conference session on computer graphics, his mind mulling over the challenge of making interactive computing more efficient. It occurred to him in that moment that, using a pair of small wheels traversing a tabletop, one wheel turning horizontally, one turning vertically, the computer could track their combined rotations and move the cursor on the display accordingly. The wheels could function something like the wheels on a planimeter – a tool used by engineers and geographers to measure areas on a map, blueprint, drawing, etc. – but in this case, rolling the wheels around on the tabletop would plot the x,y coordinates for a cursor on a computer screen. He recorded the idea in his notebook for future reference. 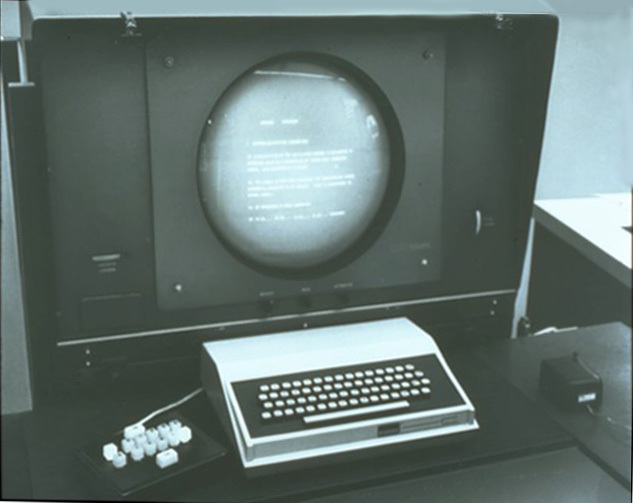 A little over a year later, Engelbart was awarded a long-awaited grant at SRI to launch his dream research initiative titled “Augmenting Human Intellect,” for which he envisioned intellectual workers sitting at high-performance interactive display workstations to access a vast online information space in which to collaborate on important challenges. He hired a small research team, and began setting up a basic lab with computer and teletypes, followed by a display terminal. By now there were several off-the-shelf solutions for moving the cursor and selecting something on a display screen, but no good data about which would be most efficient to meet Engelbart’s “high-performance” requirement. He applied for and was awarded a small grant from NASA to explore that question. Engelbart and his research staff rounded up best of breed pointing devices, and also rigged up some in-house prototypes to experiment with, such as a foot pedal and a knee-operated device. 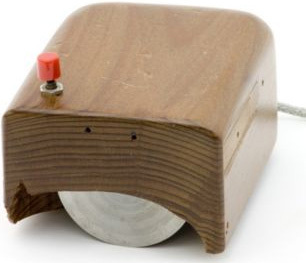 Engelbart also dug up his earlier notes which he reviewed with his lead engineer Bill English, who built a prototype of the hand-held device with perpendicular wheels mounted in a carved out wooden block, with a button on top, to test with the others. This was the first computer mouse (pictured above and below). 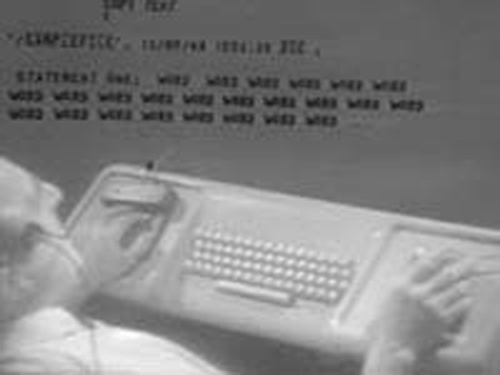 In 1965 Engelbart’s team published their final report evaluating the efficiency of the various screen-selection techniques. They had pitted the mouse against a handful of other devices, some off the shelf, some of their own making (see Mouse Alternatives below). 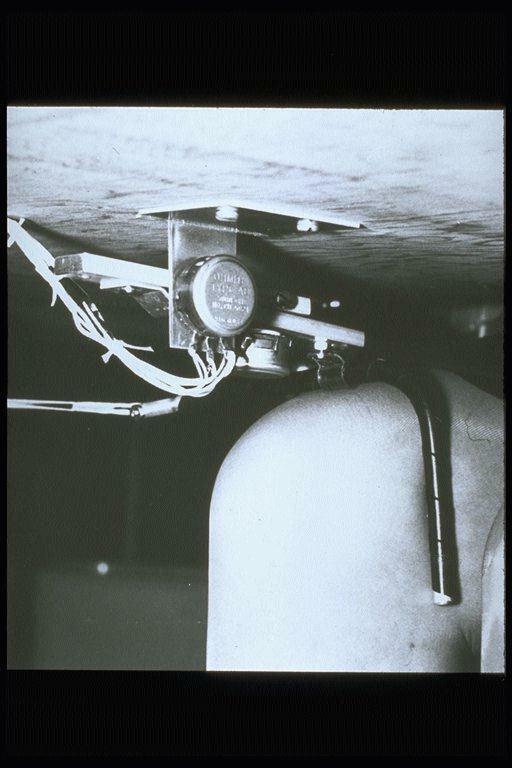 The mouse won hands down, and was thus included as standard equipment in their research moving forward (see Screen-Selection Experiments below for links to key reports and papers detailing these experiments). In 1967, SRI filed for the patent on the mouse, technically termed the “x,y position indicator,” and the patent was awarded in 1970. Enter, the Keyset: In the meantime, to further increase efficiency, Engelbart’s team thought to offer a companion to the mouse – a device for the left hand to enter commands or text while the right hand was busy pointing and clicking (shown above). After trying out several variations, they settled on a telegraph-style “keyset” with five keys akin to piano keys, which also became standard equipment in the lab (pictured below). 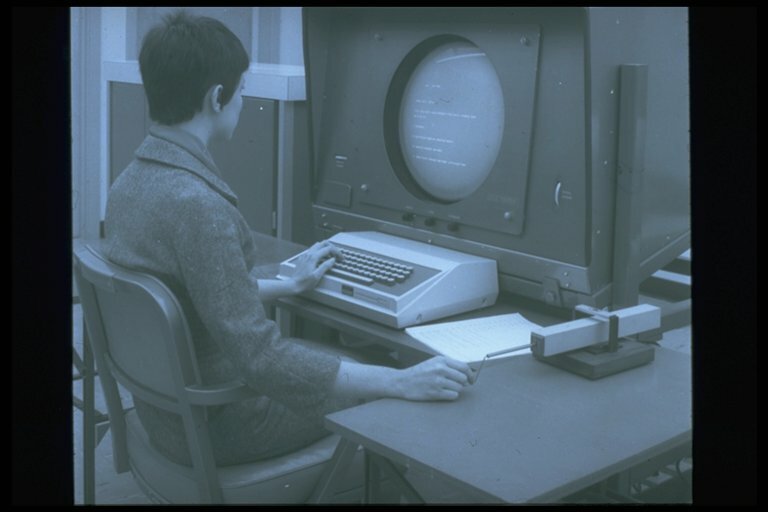 Both devices were introduced to the public in Engelbart’s 1968 demonstration, now known as the “Mother of All Demos” (see Check It Out below for links to selected video footage of the debut, historic photos, and more). “The mouse we built for the  show was an early prototype that had three buttons. We turned it around so the tail came out the top. We started with it going the other direction, but the cord got tangled when you moved your arm. I first started making notes for the mouse in ’61. At the time, the popular device for pointing on the screen was a light pen, which had come out of the radar program during the war. It was the standard way to navigate, but I didn’t think it was quite right. We set up our experiments and the mouse won in every category, even though it had never been used before. It was faster, and with it people made fewer mistakes. Five or six of us were involved in these tests, but no one can remember who started calling it a mouse. I’m surprised the name stuck. – Source: The Click Heard Round The World, by Ken Jordan, WIRED 2004. Watch Doug telling the story of how he invented the mouse in Logitech‘s 2004 interview. Witness the 1968 debut of the mouse and keyset, and watch the mouse and keyset in action in Doug’s 1968 “Mother of All Demos (see SRI’s 1968 Demo Highlights for more); take a minute to explore the Stanford University MouseSite where you will find images of the first mouse, the US Patent on the Mouse, historic photos from the lab, and much more. See also SRI’s timeline on personal computing and the mouse, Macworld’s mouse history timeline, PC Advisor’s 40th anniversary timeline, and our History in Pix photo gallery. Check out the Computer History Museum‘s online Exhibit on the Mouse and Keyset, as well as press coverage of their 2001 event “Early Computer Mouse Encounters“. The mouse later migrated from Doug’s lab at SRI to Xerox PARC, and then to Apple and others. One of the most common myths about the mouse is the mistaken belief that it was invented at Xerox PARC. Note that the patent for the mouse was filed in 1967, by which time production models were in operational use throughout Doug’s lab, three years before Xerox PARC was established in 1970. 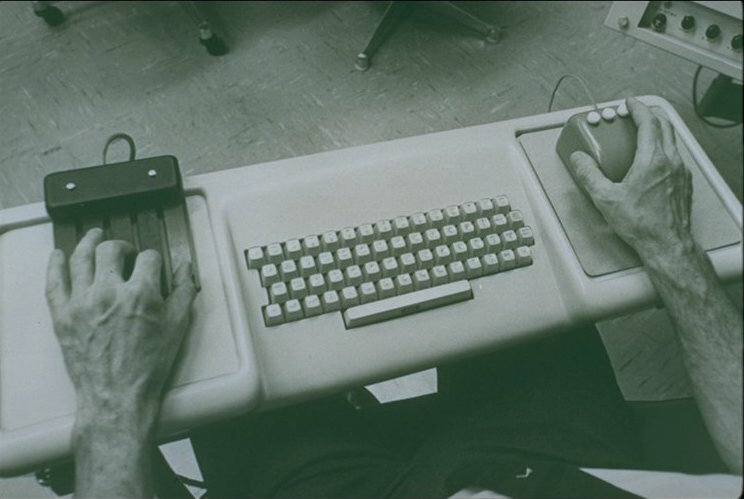 Engelbart and his team tested a half dozen pointing devices for speed and accuracy. These included the mouse plus a knee apparatus (pictured here on the left), both created in-house, along with several off the shelf devices such as DEC’s Grafacon (pictured here on the right, modified for testing purposes), a joy stick, and light pen. See Screen-Selection Experiments below for links to more details and photos. They also experimented with a foot pedal device as well as a helmet mounted device, neither of which made made it into the final tests. In the 1950s, Doug Engelbart set his sights on a lofty goal — to develop dramatically better ways to support intellectual workers around the globe in the daunting task of finding solutions to larger and larger problems with greater speed and effectiveness than ever before imagined. His goal was to revolutionize the way we work together on such tasks. He saw computers, at the time used only for number crunching, as a new medium for advancing the state of the art in collaborative knowledge work. Building on technology available at the time, his research agenda required that his team push the envelope on all fronts: they had to expand the boundaries of display technology and interactive computing and human-computer interface, help launch network computing, and invent hypermedia, groupware, knowledge management, digital libraries, computer supported software engineering, client-server architecture, the mouse, etc. on the technical front, as well as pushing the frontiers in process reengineering and continuous improvement, including inventing entirely new organizational concepts and methodologies on the human front. Engelbart even invented his own innovation strategy for accelerating the rate and scale of innovation in his lab which, by the way, proved very effective. His seminal work garnered many awards, and sparked a revolution that blossomed into the Information Age and the Internet. But as yet we have only scratched the surface of the true potential Engelbart envisioned for dramatically boosting our collective IQ in the service of humankind’s greatest challenges. MouseSite – the definitive website on the Mouse hosted by Stanford University, especially their Photos of the First Mouse page. They also curate video of the 1968 demo and other significant archives from Doug Engelbart’s work. on the history of the Mouse. Visit Logitech’s Billionth Mouse site – see the genesis of the mouse. Planimeter: Planimeters are often used by surveyors, foresters, geologists, geographers, engineers, and architects to measure areas on maps of any kind and scale, as well as plans, blueprints, or any scale drawing or plan. (source: Ben Meadows). See How Planimeters Are Used for some great visuals (thanks to Dr. Robert Foote at Wabash College), and this photo of geographers using planimeter for the 1940 census (thanks to the National Archives). See also Wikipedia’s more complete Planimeter article with links to other resources. Screen-Selection Experiments: Display-Selection Techniques for Text Manipulation, William K. English, Douglas C. Engelbart and Melvyn L. Berman, March 1967. This paper describes an experimental study into the relative merits of different CRT display-selection devices as used within a real-time, computer-display, text-manipulation system in use at Stanford Research Institute. The mouse was tested against other devices and found to be the most accurate and efficient. See also the 1965 Report and the 1966 Quarterly Report detailing their screen-selection experiments. “The Mother of All Demos” (90 min Video/Film) Doug’s 1968 debut of the NLS system for online work including hypermedia, the mouse, online collaboration, interactive computing, human computer interface, and overarching guiding principles for the research. See especially Clip 12 where Doug, sitting in San Francisco, brings in a coworker sitting in his lab in Menlo Park, to demonstrate the mouse, and Clip 13 where Doug introduces the keyset. See also our comprehensive portal page to the 1968 Demo for the basic story and links to demo highlights, archive photos and footage, background, articles, and more. 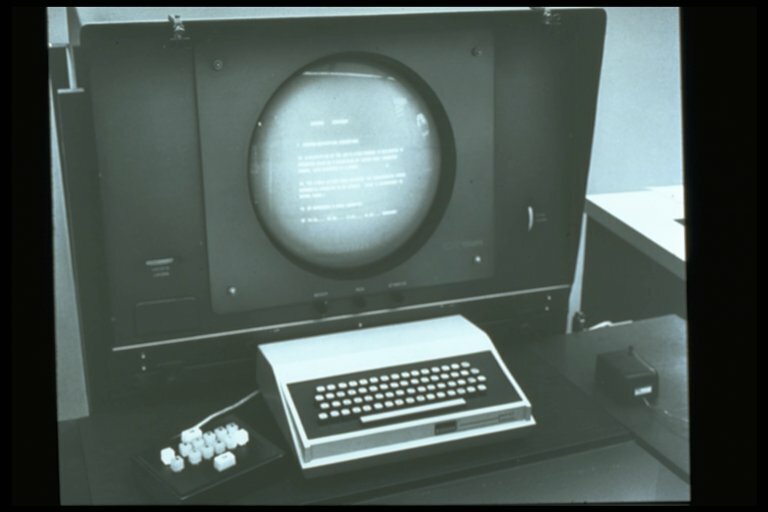 Augmenting Human Intellect: A Conceptual Framework, Douglas C. Engelbart. 1962. See for example how he envisioned an architect might work interactively with a computer in 1962 in the Introduction’s summary of Section IV (quoted at right). 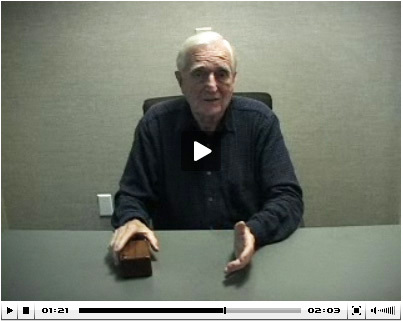 Doug Engelbart – A Lifetime Pursuit, a short biographical sketch by Christina Engelbart describes the larger context of this early work.